Simultaneously press and hold the Volume button on the bottom end + Power button until "Factory Mode" screen appears then release. Utilize the bottom of the Volume button to scroll through the available options and the top of the Volume button to select. 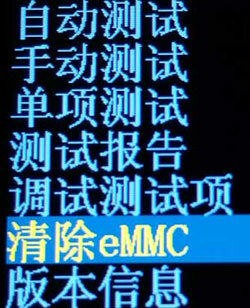 If the language displays as shown below, select the eMMC option highlighted below to complete the reset process.